The human body is extremely sensitive to electricity – it takes only a fraction of an amp to cause ventricular fibrillation, which is the interruption of your heart’s regular rhythm – and unless there’s a CPR expert standing by, that’s it – goodbye! The first priority of any electrical installation is human safety – no one should be injured as a result of an electrical malfunction. Electrocution deaths do occur though – unnecessary accidents happen regularly because of the absence of elementary protection. Sticking to the wiring regulations will just about eliminate this, although it’s never possible to completely prevent foolish behavior. They are getting rare, and these days they’re only found in old electrical installations. These old electrical installations most commonly feature the rewirable, porcelain fuse holder type. Fuses have been completely replaced in switch boxes by the miniature circuit breaker (MCB). The only fuse left in domestic installations is the service fuse. The service fuse is the fuse that the electricity company installs to connect power to the home, and this gets removed if you decide not to pay your bills. Circuit breakers (also known as MCBs) protect equipment but not people. Fuses and circuit breakers are designed to disconnect a faulty circuit – that is, a circuit in which an excessive amount of current flows. Separate miniature circuit breakers (MCBs) are installed in the switch box to protect each of the various circuits (lighting, power, stove, hot water). There is also a mains switch, which is also circuit breaker. Just to make a quick point – a switch by itself is nothing more than that: ON and OFF, whereas a circuit breaker has inbuilt current sensing, and can stop the flow of electricity when the current being drawn is significantly higher than the MCB’s RATED value. The safety switch has a technical title – ‘residual current device (RCD)’. It’s also sometimes referred to as an ‘earth leakage circuit breaker (ELCB)’.Safety switches are designed to save lives. They detect the loss of current from a circuit that indicates a person is receiving an electric shock, and they cut the power in as little as 30 milliseconds. Safety switches have been mandatory on the power outlet circuits of new homes since the early 1990s, and on the light and power circuits of new homes in most states since 2000. But many older homes do not have safety switches, and circuits such as air-conditioning, pool filters, hot water and stoves are not protected in most homes. Let’s say your child foolishly sticks a knife into the toaster to fish out a slice of bread. The knife makes contact with the metal outside of the toaster, electrifying it. 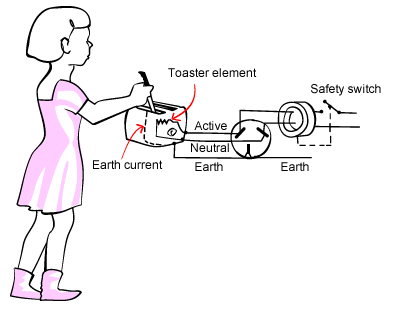 Current now flows to earth through the earth pin of the toaster plug and earth wire of the power circuit, back to the switchboard where the safety switch is located. The safety switch interrupts the circuit immediately and trips the circuit, vastly reducing the risk of injury as a result of electrocution. There’s a good reason that safety switches are now mandatory, they really do save lives. What would happen if there were no MCBs? Your house could go up in flames through an electrical fire caused by a short circuit in a bathroom fan (maybe you left it on accidentally as you left for holidays). So to recap: MCBs protect real estate and equipment. Safety switches protect you and your family. Fuses, if you still have them, should be swapped out for MCBs and safety switches. This entry was posted in Safety, Switchboards and tagged Safety Audit, Switchboards, Wired by Wyatt on August 10, 2014 by wiredbywyatt.